Welcome to my website! Enjoy exploring its pages and I hope to hear from you! I have had a lifelong love of the pipe organ and its literature. In particular, I have a profound love and affinity for the French organ literature and the French organ building school. As a young organist, I had the great fortune of spending two glorious years in Paris (1973–75), during which I developed deep friendships with French organists such as Pierre Cochereau, Jean Langlais, Marie-Claire Alain, Daniel Roth, Philippe Lefèbvre and many others. I have played and recorded on the great Clicquot and Cavaillé-Coll organs. My compositions have been performed in numerous places over the world. On Christmas Eve 2009, my Toccata-Gigue on the Sussex Carol was performed as the closing voluntary at the annual Nine Lessons and Carols service at King's College. 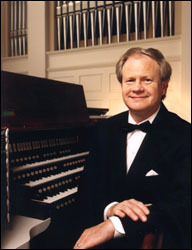 In September, 2010, organist Stephen Tharp played the world premiere of the Variations on 'Rouen' at the Meyerson Symphony Center in Dallas ('Pipedreams Live' concert), and two weeks later, he played the European premiere at St-Sulpice in Paris, France. The Dallas Chapter AGO commissioned the Tiento Grégorien, which received its premiere in October, 2010. These and more new works are available for sale at the Baroque Notes Music Store. In addition to the scores available at the store, organist Philippe Lefèbvre stars in the DVD, Improvisation Masterclass. It was filmed in SMU's Perkins Chapel on November 1, 2010. Philippe, who is titular organist at Notre-Dame Cathedral, and Paris Conservatoire improvisation professor, presents specific techniques and gives examples in the art of improvisation in the French style. Anyone wishing to improvise, from beginners to advanced practitioners, will find many helpful and practical tips in this unique film. A bonus feature at the end of the film is an improvisation by Philippe at Notre-Dame, which demonstrates many of the colors of the organ, from the celestes to the tutti. The music is accompanied by a slide show of the Cathedral and its magnificent organ. With great excitement, I have become the American representative for Orgues Bertrand Cattiaux. Organbuilder Bertrand Cattiaux, with his 28 years of organ building expertise, can deliver a beautiful new pipe organ in the true French style. My role in this venture is as liaison and consultant. If you are interested in discussing a new Bertrand Cattiaux pipe organ, please contact me at orguescattiauxusa@gmail.com. If you would like me to present a concert or workshop, please email John McElliott, or visit the Karen McFarlane Artists, Inc. website. For other issues, such as a new music commissions, feel free to contact me directly. Please enjoy your visit and return often. Check out the latest news. Vive l'orgue! The Baroque Notes Music Store is open. Visit the store to purchase compositions by Dr. George Baker and the Improvisation Masterclass DVD. Dr. Baker is the American representative for Orgues Bertrand Cattiaux, an organbuilder in the true French style. Contact him at orguescattiauxusa@gmail.com to discuss a new Bertrand Cattiaux pipe organ.